Did you have a favorite book as a child? I had a handful: The Little House series, by Laura Ingalls Wilder. Much-loved books on display at the Masters Hotel in Burr Oak, Iowa. My older sister Kari loved them too. We dreamed of one day visiting each of the historic sites devoted to the famous author. 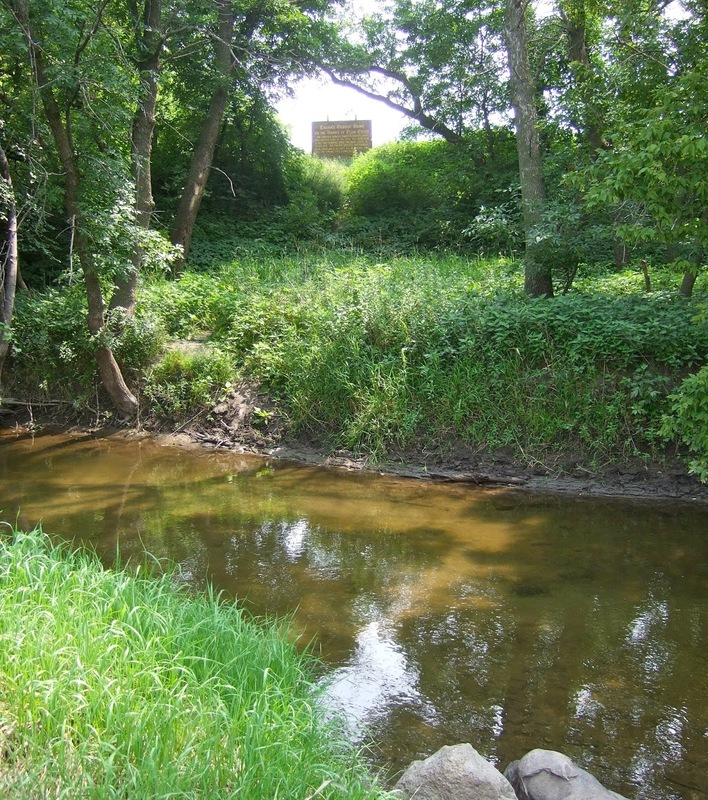 The Banks of Plum Creek near Walnut Grove, Minnesota. The sign marks the original Ingalls dugout site. Well, we finally made it! We're making the loop. It is extremely cool to walk the ground where Laura once walked. 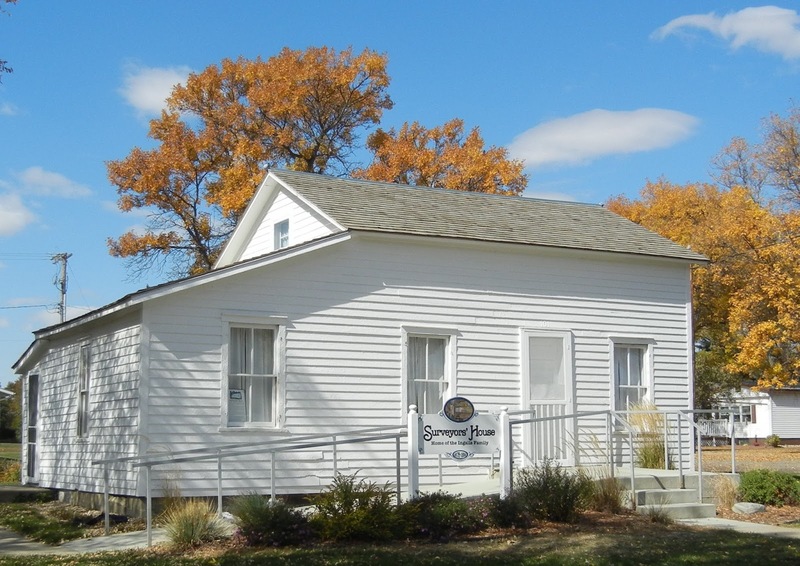 The Surveyors' House, De Smet, South Dakota. We have run into a few problems. At the very first homesite, somebody died. Not a pleasant way to start such a journey. Replica of the House in the Big Woods, Pepin, Wisconsin. And, I'm pretty sure that somebody knows I'm traveling with a quilt Laura once owned. As you can imagine, it's worth a whole lot of money. Reproduction quilt by Linda Halpin. And, something's up with Kari, but she won't tell me what's bothering her. And, Roelke McKenna, my guy, wants to buy his family farm and share it with me. I'm not at all sure we're ready to live together, much less sink every penny into a neglected farm. You can see how it all turns out in Death on the Prairie. But please don't let my misadventures stop you from getting out to see the sites yourself, if you can! I guarantee a happy return to childhood. Giveaway! Leave a comment below by midnight, July 19, for a chance to win a copy of Death on the Prairie. Please include your email (such as reader<at>reader.com) so you can be notified. 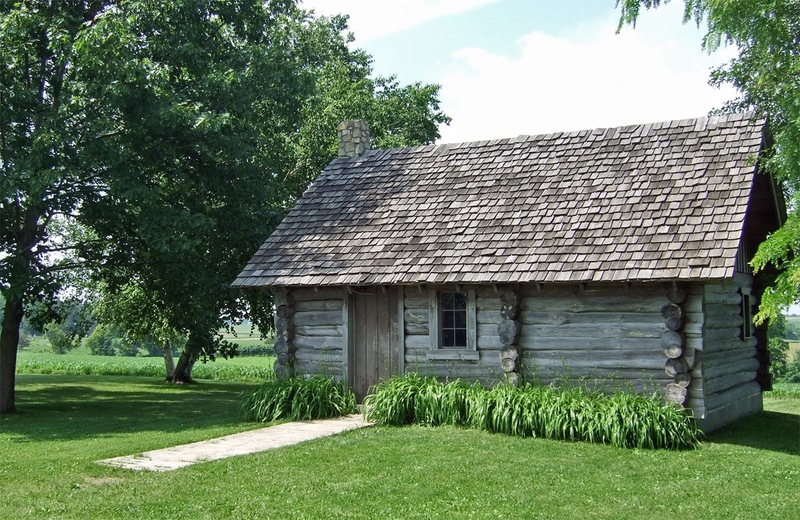 Author Kathleen Ernst had a great time revisiting her favorite childhood books--and their settings--as she worked on Death on the Prairie, the 6th Chloe Ellefson mystery. To learn more about the series, visit Kathleen's website. Thanks, Kory! Your name is in the hat. It was fun to write--I hope it's fun to read as well. Carol, that's fine. You're entered! The Book sounds different which adds to it...please enter me. Hi Marilyn - you're entered! I never read those books. I loved mysteries, especially Hardy Boys. I read a few Hardy Boys...my favorite mysteries were the Trixie Belden books. Sounds like an awesome book and new series for me to try. Hi Melissa - I wasn't too excited about going to Mansfield, since Laura hadn't included it in the Little House series, but I *loved* it. It felt as if she'd just walked out of the house. They just opened a new museum, and I hope to visit that one day. My sister and I loved the Little House books and visited all the sites. Playing "olden days" was a favorite way to entertain ourselves! I loved playing olden days too. It really captured my imagination--and led to my writing interests! It was fun to see the sites with my sister, since we'd shared the books. My Mother loved these books. I visited what is now Redwood Falls, MN every summer on business. Interesting area. One of the special things about the series, I think, is how many moms passed their love of the stories down. Hi Daniele - you're entered! I loved those little house books. I'm sure I'd enjoy this series, too. Thanks for the giveaway. Who wouldn't love this book? What lovely pictures. Sounds like a good read - hang on to that quilt! Thanks for the giveaway. I treasure the quilt! A friend who happens to be an expert on Laura and quilting made it for me. Glad you enjoyed the photos. To be honest, I was never a fan of Little House on the Prairie...but I have plenty of other childhood favorites. And I love visiting historical/literary sites. Thanks for the chance to win! No book(s) appeals to everyone! I was not a fan of Nancy Drew, and that confessions has gotten me in hot water with mystery lovers more than once. Hi Brittany - I hope you enjoy the series! Thanks so much. Rhonda, Walnut Grove is one of my favorite sites. I can just see Laura playing in the creek when I visit! Oh, I would lie to read this. Wow,another new series for me! Thanks for the chance to win. I'm glad you enjoyed the photos! It was very special to visit all of the locations. Hi my name is Lois Rotella. email is rainonlois@aol.com. I read mysteries as a kid. I liked the Hardy Boys and Nancy Drew books. It would be fun the to win this book. Lois, your name is in the hat! Nicole, it's never too late. One of the things I admire about the series is that I enjoy the books as much now as I did as a child. It takes a good writer to pull that off! I liked the Black Stallion books and also the Tom Swift books when I was a kid. I liked the Black Stallion books too, but I don't think I ever read Tom Swift titles. I'll have to take a look! Oh, I read some of those too. Great fun! Thanks so much, Annette! Throughout the series I try to give readers armchair visits to special places, and each book has a page on my website with lots more information, photos, maps, etc. That's the fun of writing about real places. Oh,I would so love to win this! It would be a great addition to my collection of Laura Ingalls Wilder books. Becky, your name is in the hat! Good luck. Oh, I loved Anne too. I'd like to visit PEI one day and see the setting! Thanks! Heidi was a particular favorite of mine as well. My father's parents were Swiss immigrants and Heidi transported me to the alps. I have never read any of the books in this series, but it look good. Thanks for the chance to win! Love another killer character blog and reading it through Chloe's eyes. I already have, and read the book, so I don't need another. Just wanted you to know I love this blog! Ruth, thanks so much! It's a fun approach, and I'm delighted that I was invited to join. Book sounds amazing! This is a new author and series to me. Looking forward to reading. You're entered, Dianne! Hope you enjoy. I love your books. I grew up reading Laura Ingalls Wilder's books and that quilt is beautiful. What a great thing to own. I love your Chloe Ellefson books. My current read is Death on the Prairie. Thanks for igniting a passion to visit all the sites from all the books, including Rock Island. Thanks so much--that's music to my ears! I love hearing that readers become interested in visiting the real sites featured in the books. I would so love to win this book. Thanks for the chance. So many of us were introduced to Laura Ingalls Wilder by a mom or grandma. I love that kind of sharing! Vicki, what wonderful family heirlooms! My set was new when my sister and I were kids, and a set of hardcover books was a very big deal. 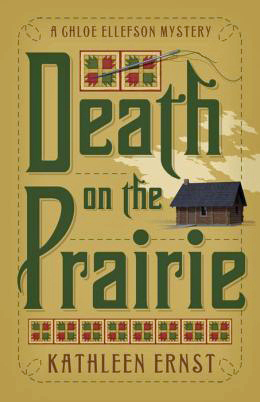 Love the LH books, and am looking forward to reading Death on the Prairie. I hope you enjoy! You're entered. I appreciated the Little House on the Prarie series more as an adult than I did as a child. I was almost afraid to read them again as an adult, because sometimes beloved childhood favorites don't hold up over time. But I too found new layers to appreciate as an adult. I loved the Little House books when I was younger, and read every one I could get my hands on (of course, I know there were plenty of books in the series I'd never get to read because our library didn't carry them all). I loved the TV series as well, and always wanted to visit the sites from the books someday. I actually have been to Minnesota, and probably drove right past some of the sites without realizing it, but I was there on business so didn't get to sightsee. Christine, if you ever get the chance, you'd probably love visiting the sites! I have more photos of each on my website as well, http://www.kathleenernst.com/book_death_on_prairie.php. The TV series is a great favorite too. I always loved the book HEIDI as well. Another Heidi fan! One of my favorites as well. I am another Little House fan and have a copy of Wilder Rose on my kindle to read. Another Boxcar fan! I think I need to revisit those. What a fun link, to see your grandfather's name! My pleasure, Patty! Nice to meet another fan. Always loved the Laura books...blending that history into a mystery with Chloe is a wonderful idea! It was great fun, I must admit. Read all the Little House books when I was younger; loved them. Forgive me if I accidentally post twice! I'll soon be introducing my daughter to Little House on the Prairie and am now looking forward to checking out Death on the Prairie for me! What fun to introduce your daughter to books you enjoyed! I'd love to read your book. I enjoyed the Little House books. I liked Caddie Woodlawn even more. And Anne of Green Gables. And Mary O'hara's series. I don't think I know Mary O'Hara's series--I'll have to check that out! Envy! I'm eager to see the new museum in Missouri. Enjoy! Anxious to read Killer Characters ! Thanks so much - I'm glad you enjoy the Chloe series! I love the Laura Ingalls Wilder books. I'm having great fun with the series. These books turned me into a reader and a children's librarian. I now homeschool in Texas and have taken my kids to Missouri, Kansas, Iowa, South Dakota, And Walnut Grove. We are going back to Mansfield next week to see the new museum and my daughters and I are just too excited! Thanks for sharing your stories! I'm so eager to see the new museum! Have a wonderful trip. How special to share the books through the family. And have fun quilting! I loved Little House on the Prairie, particularly the Long Winter. That's one of my favorites too. I'll be discussing that book on my blog soon: www.sitesandstories.wordpress.com. Stop by if you can! I used to watch little house on the prairie I still have two books of the series!! Was my fav show I never missed it I loive the sound of your book I would like a chance to win!!! I love your books! Thanks for all that you do! Love books with Midwest settings.thanks for the chance to win your book. The Little House books were also my favorite. I loved visiting the homesites so much. It's very special to walk the ground, isn't it? I liked reading many classics Heidi was one of my favorites. I loved the tv show Little House on the Prairie, never read one of the books. I hope to read Death on the Prairie. Hope I am not to late to enter. This book sounds very interesting. Thank you for the giveaway. I enjoyed these books growing up nand willn read Death on the Prairie no matter what. Winning would make my day. I loved the Little House books. Also Trixie Beldon, Nancy Drew, Cherry Ames and the Hardy Boys. I fell in love with mysteries at an early age. I am looking forward to the next Chloe book! Oh gosh, I loved the Cherry Ames books! I read my mom's set. Don't hear anyone mention those very often! Harriet the Spy was another favorite of mine, too. That sounds very interesting! Yes, I loved the Little House books. Nancy Drew books were also tops on my list. Hi Kate - it is different to wander into the nonfiction Wilder world, but very interesting too. My favorite childhood books were the Little House series, but I've only made it to the Rocky Hill house. My cousin and I drove there when we were 18 and 19, and I still remember it vividly almost 30 years later. I hope someday we can make it to a few more. Love the sound of this book! I hope the book might take you on an armchair tour! I've read the Laura Ingalls Wilder series many times. I would love to win Death on the Prairie. Congratulations to Tamara Gassen, who won a personalized copy of Death On The Prairie: A Chloe Ellefsen Mystery in the giveaway! Thanks for all the entries. Happy reading!